Nothing says it more about a product than hearing about it from the customers mouth! (If you would like to see your business below, please email Tawnya your testimonial together with your picture to share your success with the world. AND send us your videos and audios too if you want to stand out from the rest). After working in the corporate world for several years, I left my administrative position in April. I was tired and frustrated with balancing the two competing roles in my life: being the best mother and the best employee I could be. While researching options that would allow me to work at home, I discovered a new industry, virtual assistance, which would allow me to work at home on a schedule I chose, do the work I enjoy, and still be available for my family. A month later, I had my first virtual client but I didn’t have a business. I had no idea how to develop a business, how to create a website, or how to market my business. For months I struggled on my own, researching how to start and develop a business and writing lists of the detailed tasks I needed to accomplish to make my business into what I envisioned. Discovering this startup training center simplified this process by giving me a structured plan to bring this vision to light. It is a comprehensive package that combines all the information and resources necessary to starting a virtual assistant business, along with an easy to follow schedule. It’s called “The VAC”, but the program is flexible enough to accommodate whatever time frame you have. Tawnya Sutherland explains the various aspects of setting up and running a VA business in simple language, but with enough detail that the information is still helpful and relevant. I had no experience running a business, so the sections on selecting a business structure, how to choose a business name, and writing mission and vision statements helped me to define my virtual assistant business. I learned it’s important to have these foundations in place so you know what you’re building and why. 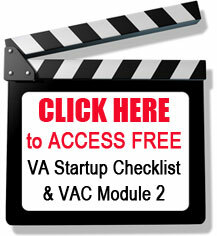 The templates, videos and ebooks included in the VAC have been invaluable in starting my VA business. After choosing one of the attractive website templates and using the coupon for a year of website hosting, getting my first website up was a snap. I could have designed all my own stationery, but using their templates made the process much quicker. I now know how to market my business, and I have a plan for business development. After-purchase support, from Tawnya and from other VAC in the forum, has been both helpful and readily available. When I first purchased the VAC, I wondered if I had done the right thing. Maybe I was taking the easy way out by not doing all this work on my own. I shared these thoughts with a friend, who reminded me that a smart business person knows what her limits are, and engages appropriate help when needed. That friend was right – buying the VAC was a sound business decision. The VAC has made my virtual assistant business a reality! Thank you for putting the VAC together for individuals wishing to start a Virtual Assistant business or to grow theirs. I couldn’t believe all the information that was compiled all in one place. I really appreciated the business templates. It’s really made it easier to open my business. I haven’t seen anything else that takes you in a step-by-step process from asking questions to make sure you’re ready to start your own business, to marketing, operations, finance, etc. The VAC is also a system to not only assist VAs but anyone wanting to start a small business. You’ve put a lot of effort and energy into this training center Tawnya. I can tell that you love what you do because you’ve put your heart and soul into this system to help others. Thank you for all your hard work. Tawnya Sutherland’s Virtual Assistant Career has been invaluable to me in kick starting my practice. For me, it has been the operation of my operation! The excellent reference materials and support from the VAnetworking family have helped me transform any fear of operating my own practice into excitement! Thank you Tawnya for providing a tool that functions as the superior framework upon which Dellagation continues to grow. Everything that you need to start your Virtual Assistant business is provided for you in this system. The online training modules are simple to read, and have an easy to follow plan to ensure you get all information you require. I have saved hours of my valuable time by utilizing the many templates provided. This system allows me to spend more time growing my business and less time creating forms. It is an asset to any new Virtual Assistant. Even though I have worked remotely from my residence for the past seven years, I was an employee for a firm. When the time came for me to start my own VA biz, I did not know where to start. 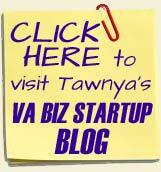 Upon my research, I came across Tawnya’s VAC which was so instrumental in knowing just how to get started. It contained ALL the necessary document templates to get my business off the ground. I ordered it in February, immediately created brochures and to date, have two potential Clients. I highly recommend the VAC! My name is Anita Carmichael. I have been an administrative assistant for 20+ years and it was approximately a year ago that I definitely needed more of a challenge career wise. I have 2 children very close in age to each other and my job though fulltime had the benefit of having major holidays off which always suited my family very well. Now that the children are older and have their own interests, friends, etc., I was looking to fill more of my days but didn’t want another full time job out of the house where I would have to pay extra for camps, daycare, etc. I wanted to be at home but making some money. Then a few months ago I was on a search engine and “virtual assistant” came up. Well, I could not believe the wealth of information forthcoming. Not only that, but when I logged in and became a member of VAnetworking.com Forum, I was overwhelmed. Yes, I wanted to do this. Yes, I knew I could be good even great at this, but where do I start? Then I found the link for the VAC. I was skeptical but when I downloaded the sampler, read through the testimonials, and Tawnya’s inspirational words, I was hooked. I had to have this! When I received the VAC, even though I had an idea what was in it; I was still amazed! The templates are all there for you to use – what a timesaver! Templates for flyers, invoices, newsletters, etc., not to mention the business cards! The modules are set up in an easy day-day-to format, outlining each task in detail (business name, web site set up, marketing, etc.). Now I had a starting point and did not feel overwhelmed. 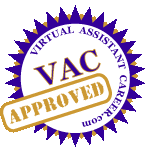 I highly recommend the VAC to virtual assistant newbies who are just starting their business to the seasoned virtual assistant veterans who want to give their business a more competitive edge and to everyone in between. I’ve always wanted to own my own business, and I knew that I wanted it to be a home based business. I came across the term Virtual Assistant and was immediately intrigued. I knew that this was exactly the opportunity that I had been looking for. I must admit that VAC was not the first Virtual Assistant training program that I purchased, but it was definitely the last. The VAC is very well laid out and walks you through every step of the process for setting up a successful Virtual Assistant business. My favorite part of the VAC is a toss up between the free templates, these have saved me hours of time, and the VA networking forum, where no question is stupid and everyone freely shares their knowledge and experience. I would definitely recommend the VAC to anyone looking to start their own Virtual Assistant business. ORDER NOW and START Your Virtual Assistant Career today!